From beneath the soil, the Green Hell Rose Vampire is born! Cast in green vinyl with red, dark green, soft yellow and light blue spay, this adorable sprout stalks the living who would destroy the Earth from whence it came. Available Saturday, September 26th, $25 each..
Oh! I really want to pick this up! I need to have this, What is the price on this? 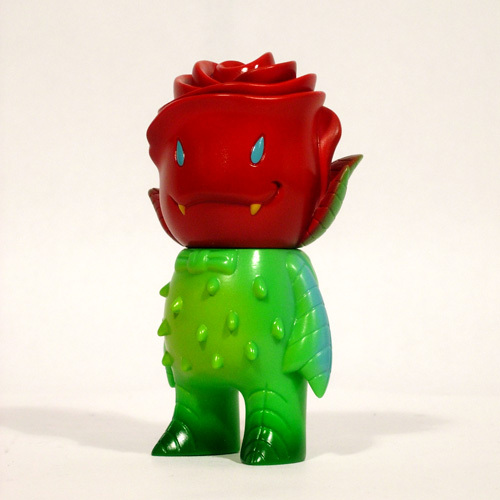 I can’t wait to pick up a Green Hell Rose Vampire! This figure’s sick…looking forward to future colorways! Nooo, I can’t believe I missed out on the Green Hell Rose Vampire! That’s what I get for traveling on the day it was released. Any chance one fell through the cracks!? !